Researchers at Stony Brook University in collaboration with colleagues at Johns Hopkins School of Medicine used DNA sequencing methods to make a new discovery: the direct causation of exposure to aristolochic acid (AA), which is found in a plant that’s been used in herbal remedies for thousands of years, in the development of urothelial cancer. “Results of our study results not only points to aristolochic acid as being a cause of urothelial cancer, which is an important global health message, but also provides new methods for identifying environmental exposures to aristolochic acid,” said Arthur Grollman, MD, of Stony Brook University. According to a Stony Brook University news article, the study’s results were reported online in Science Translational Medicine. Co-authors Dr. Rosenquist and Dr. Kinzler sequenced the exome in DNA from both upper urothelial tumor tissue and non-tumor tissue in Taiwanese patients. One of the two sets of patients included people the doctors believed to have been exposed to AA, while the other group included known smokers. The researchers believe their findings will have a great impact on global health, as AA is found in plants used for their herbal properties in Asian countries especially. In addition to contributing a great deal of knowledge to the life sciences, Stony Brook University receives a wealth of funding from the NIH and NSF that may interest lab suppliers marketing life science products and working to sell lab equipment. The NIH awarded Stony Brook University $59.3 million in research funding in 2012. For a full list of departments receiving funding, organized by department name, number of awards received and total funding awarded, please visit the NIH website. In the same year, Stony Brook University received $22.1 million from the NSF. For more information on life science projects receiving NSF funding, organized by funding organization, project title and total funding awarded, please visit the NSF website. 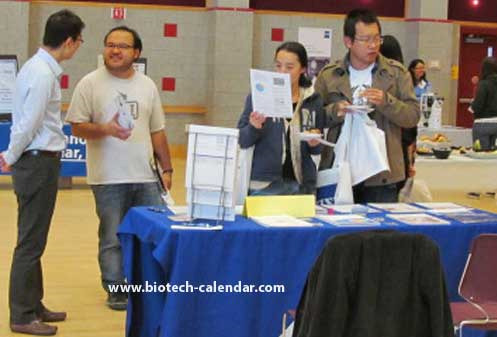 If you are a lab supplier interested in marketing life science products and working to sell lab equipment at life science marketing events in New York, Biotechnology Calendar, Inc. invites you to exhibit at our Stony Brook BioResearch Product Faire™ Event on October 3rd, 2013. Last year, the Stony Brook BioResearch Product Faire™ attracted 186 attendees. Of the attendees, 42 were purchasing agents, professors and post docs, and 18 were lab managers. The visitors came from 16 different research buildings and 28 departments around campus. Biotechnology Calendar, Inc. is a full-service science research marketing and events-planning company that organizes on-campus life science marketing events nationwide. If you are interested in marketing your life science products and working to sell lab equipment at life science marketing events closer to home, we encourage you to view our 2013 calendar of events. For more information on our Stony Brook BioResearch Product Faire™ Event, or to view more detailed funding statistics on Stony Brook University, click on the button below.